The objective of the Second Career program is to provide laid-off, unemployed individuals with skills training to help them find employment in occupations with demonstrated labour market prospects in Ontario. The intention of the Second Career program is to return individuals to employment by the most cost effective path. The Second Career program has a $28 000 maximum for costs excluding disability needs, dependent care, living away from home allowance and alls costs related to LBS training. 3. What will be my contribution? Still have questions? Consult these Frequently Asked Questions on the Ministry of Training, Colleges and Universities website. 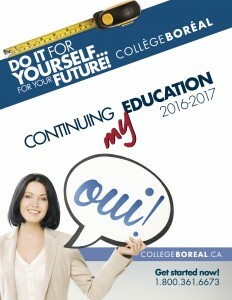 2) Complete a pre-admission application* to Collège Boréal on the date and time indicated by the employment advisor.